The IPSI-6 Summary Report is now available for download here. The Sixth Global Conference of the International Partnership for the Satoyama Initiative (IPSI-6) was held from 12 to 14 January 2016 at the Empress Angkor Hotel in Siem Reap, Cambodia. The conference was organized by the IPSI Secretariat and hosted by the Ministry of Environment of the Government of the Kingdom of Cambodia, and consisted of a meeting of the IPSI General Assembly and a Public Forum, plus an excursion to nearby sites, a reception, and other opportunities for participants to interact. The IPSI General Assembly is primarily a forum for information-sharing and decisions regarding the future direction of IPSI, and is open to all IPSI members. Others were welcome to observe the Sixth Meeting. Highlights this time included the welcoming of new IPSI members and the rotation of the membership of the IPSI Steering Committee. The meeting was co-chaired by Prof. Kazuhiko Takeuchi, Senior Vice-Rector of the United Nations University and Mr. Tin Ponlok, Secretary General, General Secretariat for the National Council for Sustainable Development of Cambodia. The Public Forum is an opportunity for non-members to learn about IPSI and its activities as well as a venue for discussion of various topics related to socio-ecological production landscapes and seascapes (SEPLS), their revitalization and sustainable management. The IPSI-6 Public Forum was held with the theme “Planning and reviewing strategic actions for sustainable landscape and seascape management”, and featured a number of interesting presentations on this theme as well as working-group discussions for IPSI members from around the world and participants. The Sixth Meeting of the IPSI General Assembly was held from 13:30 to 15:30 on Tuesday, 12 January, 2016. The General Assembly is primarily for information-sharing and decisions regarding the future direction of IPSI, and is open to all IPSI members. This meeting was co-chaired by by Prof. Kazuhiko Takeuchi, Senior Vice-Rector of the United Nations University and Mr. Tin Ponlok, Secretary General, General Secretariat for the National Council for Sustainable Development of Cambodia. Reports from the Chair of the IPSI Steering Committee and the IPSI Secretariat welcomed new members to the partnership and announced the endorsement of new IPSI Collaborative Activities. Also, the General Assembly determined the makeup of the IPSI Steering Committee for its next term. The Public Forum is open to the general public as well as IPSI members, and was held from 16:00 on Tuesday, 12 January to 17:30 on Wednesday, 13 January 2016. The Public Forum is an opportunity for non-members to learn about IPSI and its activities as well as a venue for discussion of various topics related to socio-ecological production landscapes and seascapes (SEPLS), their revitalization and sustainable management. This time, the meeting was held as a part of the interim review process for the IPSI Plan of Action 2013-2018, with the theme “Planning and reviewing strategic actions for sustainable landscape and seascape management”. It featured a number of interesting presentations on this theme as well as working-group discussions for IPSI members from around the world and participants. Mr. William Dunbar of the IPSI Secretariat then gave an overview and introduction to the Satoyama Initiative, IPSI and the plan for the rest of IPSI-6: Introduction to Satoyama Initiative and IPSI-6 Public Forum. Participants were divided into four working groups, one for each of the Strategic Objectives found in the IPSI Strategy and Plan of Action 2013-2018. Each working group featured a number of presentations from its participants, followed by discussion to identify key messages and lessons learned. These were then presented in the final plenary for further discussion to identify key themes for the conference as a whole. Group 1: Increase knowledge and understanding of SEPLS. Group 2: Address the direct and underlying causes responsible for the decline or loss of biological and cultural diversity as well as ecological and socio-economic services from SEPLS. Group 3: Enhance benefits from SEPLS. Group 4: Enhance the human, institutional and sustainable financial capacities for the implementation of the Satoyama Initiative. Each of these presentations was followed by additional information from the IPSI Secretariat on the ongoing process of the interim review of the Plan of Action. The Secretariat had sent a questionnaire to all IPSI members on their use and opinion of the Plan of Action, and results from the initial analysis of the questionnaires was presented by the Secretariat’s Ms. Caecilia Manago. Both the questionnaires and the discussions held at IPSI-6 were vital data for the interim review process, due to be finished in the near future after the conference. Finally, a wrap-up discussion was led by the moderators, who then gave their final remarks, noting the importance of information-sharing within the partnership, in addition to a “flat”, inclusive approach while maintaining a holistic perspective. It was pointed out that a lot has been learned so far in the five years since the launching of IPSI, while the Plan of Action has facilitated a wide variety of actions by partners. The moderators finally expressed their hope that synergies between members will continue and increase, and that synergies can also be found with other initiatives including those on the UN’s Sustainable Development Goals (SDGs) and climate change. 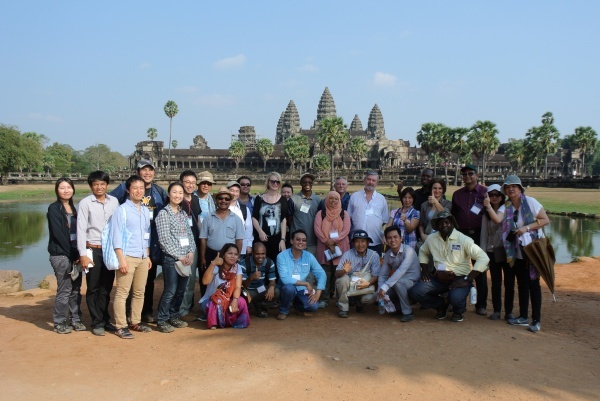 An excursion to several sites around Siem Reap and the Angkor Wat complex was organized for participants by the Ministry of Environment of Cambodia. Participants first observed human and natural resource use interactions at Srah Srang Village and its Khmer Habitat Centre, seeing some of the local production activities including those related to the area’s main industry, tourism. They then had a chance to sample some of the local delicacies produced sustainably from local products and with zero plastic garbage. Next, participants visited Neak Pon and Preah Kahn to learn about the ancient and modern role of water in the landscape. The large reservoir that had been drained is now being refilled as part of the water-management strategy by the APSARA Authority, both to protect the landscape and to provide water for the growing city of Siem Reap. Lastly, visits were organized to the temples of Bayon and Angkor Wat to show the cultural heritage of the monuments, which are now the main tourism attractions in the area and a major source of income.